The articles would be written by generals, Union and Confederate alike, who had commanded the engagements two decades earlier—“or, if he were not living,” by “the person most entitled to speak for him or in his place.” The pieces would present both sides of each major battle, and would be fair and free of politics. 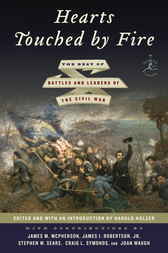 In commemoration of the 150th anniversary of the Civil War, the most enduring entries from the classic four-volume series Battles and Leaders of the Civil War have now been edited and merged into one definitive volume. Here are the best of the immortal first-person accounts of the Civil War originally published in the pages of The Century Magazine more than a hundred years ago. No one interested in our country’s past will want to be without this collection of the most popular and influential first-person Civil War memoirs ever published. Harold Holzer is one of the country’s leading authorities on the political culture of the Civil War era. The former co-chair of the United States Lincoln Bicentennial Commission, he is a frequent guest on such TV shows as Today, Charlie Rose, and PBS NewsHour. Holzer has authored, co-authored, or edited thirty-six books, and is senior vice president for external affairs at the Metropolitan Museum of Art. He was awarded the National Humanities Medal in November 2008.